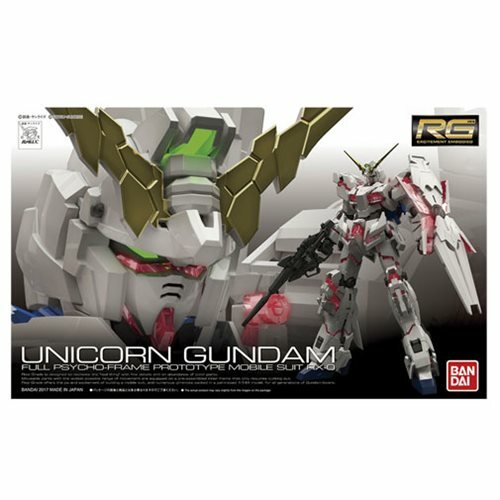 Part of the GunPla evolution project, the Gundam Unicorn Real Grade 1:144 Scale Model Kit features the next level in GunPla technology and design. From the very beginning, this version was created to be able to perform its iconic destroy mode transformation with stability and ease. The advanced joint incorporates clear translucent plastic for Psyco frame along with locking and linking mechanisms to ensure the smoothest transformation possible. Set includes 1x beam magnum, 1x shield, 2x beam sabers, 1x hyper bazooka, 10x runner, 1x Sticker sheet, and 1x instruction manual. Measures about 5-inches tall. Ages 14 and up.